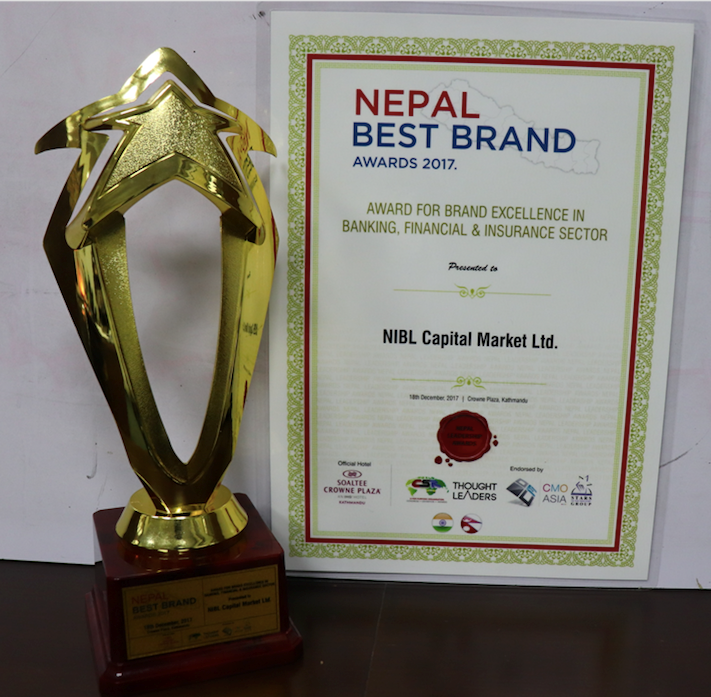 NIBL Capital Markets Limited has won the Nepal Best Brand Awards, 2017 – Under the title ‘Brand Excellence in Banking, Financial services and Insurance sector. This award ceremony was organized by CMO Asia at Crowne Plaza Kathmandu on 18th December, 2017. The program was hosted by Dr. R.L Bhatia founder of World CSR Day and World Sustainability and award was handed over by our Honorable finance state minister Mr. Udaya SJB Rana. The participants were from various sectors such as Banking, Insurance, Travels and Tourism, Automobiles, Bio- Technology, Construction and Real Estate sector etc. The winners were selected on basis of core activities presented to organizer.Issuing the statement, NIBL Capital Markets Limited said that “This award will certainly add value to NIBL Capital Markets and a boost to excel immaculately to provide best of our services to all of present and future clients as promised now and in near future”.